The toolkit is a deliberately 'low-tech' solution, nothing more than an Excel spreadsheet that can be developed by academic developers, used by academic teaching staff and shared with students. As the early iterations of the SOLE model were explored with academic colleagues, the original goals were revised in response to the demand to ‘actualise’ the model in some meaningful way. The embodying of theory within a model became a quest to embed the theoretical principles within a practical manifestation of the model. The model, without the associated toolkit, is in itself a team discussion tool, a course-based instrument for planning and development and a means of visualising one’s practice and assumptions about that practice. The toolkit provides much the same opportunities but also allows the academic, and ultimately the student, to work ‘within’ a learning design, diagnosing expected activity, adjusting the balance of engagement through the development process, describing (as an advanced organiser) what the learning might look like and providing opportunities for ongoing evaluation. The first version of the toolkit, as an Excel 2007 Spreadsheet, was shared with staff in a series of workshops in May and June 2010 at Massey University, New Zealand. An automatically generated pie chart provides quick visual information to a student to remind them that there is a balance of activity with which to engage. It is hoped that staff will share their resulting ‘patterns’ as models of pedagogical approaches. It is also anticipated that staff would, in many cases, leave the spreadsheets open for students to complete with actual details of activity and time recorded. In both cases, this offers the prospects of ongoing evaluation and development of learning designs through ‘shareable representations of beliefs and of practice‘ (Conole et al., 2004, p. 18). 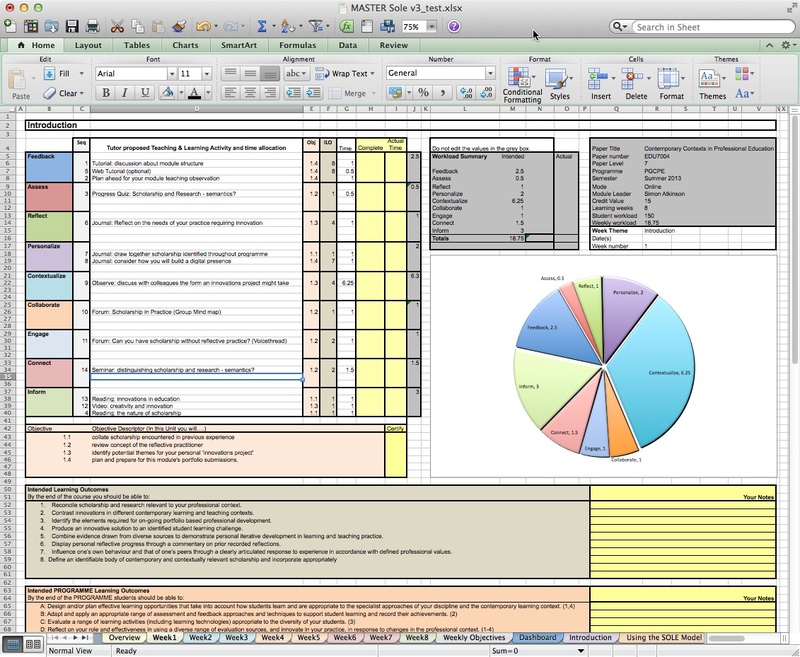 The intention is that the spreadsheet toolkit produces a clear visual representation that is given to the student to form an advanced organiser. A review of the completed spreadsheets would perhaps then act as a useful evaluation exercise, identifying activities that were particularly beneficial or making clear a learning designer’s unrealistic expectations. Further iterations of the toolkit have followed and in September 2010 version 1.2 was released on the Internet, expanding the toolset for staff and students. As well as a revised explanatory worksheet that detailed the nine effective elements of the model with extensive guidance and questions and prompts towards effective practice, an option was included to allow for the ‘actual’ time spent to be recorded by students on a distributed version of the toolkit as a spreadsheet rather than as a PDF for printing. The pedagogical guidance embedded in the toolkit is intended to be layered, so that in column C of the spreadsheet a cell with a detailed description of an element has an embedded comment associated with it, in column D each guiding question to support reflection also has an embedded comment and individual resources in column E can support institutionally contextualised guidance . Staff also are provided with the opportunity to detail the assessment requirements and provide students with a repeated sense of the effective alignment of learning outcomes, assessment and teaching and learning activities. Version 2.3 (August 2011) introduced a 'dashboard' allowing the course designer to see the distribution of student workload across all the weeks, or learning units, and version 2.4 (October 2011) saw the incorporation of a 'Weekly Objectives' view, drawing together the weekly objectives set against the module outcomes for the first time. Each iteration is designed to provide staff and student with a greater transparency to the learning design intention. Version 2.4 was also distributed as a fully populated exemplar, rather than a blank template to aid its deconstruction and usage. Version 3.0 (September 2014) incorporated a greater degree of tracking opportunities, allowing students to record their progress as well as allowing faculty to sequence activities to further support the learner journey. Version 3.5 (May 2015) added a whole new dimension, that of visually representing the modes or environments in which learning is planned to take place. For some designers this appears more meaningful to them than the 'abstract' concepts of 'modes of engagement' or the elements of the SOLE model however it is strongly advised that people continue to map activity against the model in order to provide the most meaningful view for students and to aid their meta-cognition. One of the reasons for choosing to adopt a familiar desktop spreadsheet application as the basis for a toolkit was to avoid any need for students to download any additional software, and to see the toolkit as something adaptable, personalised and shareable. For the majority of students, the software is expected to be familiar but for those who have not engaged with spreadsheets before it can be argued that to do so would have beneficial consequences. Spreadsheets can still, it is suggested, provide a rich and meaningful environment in which students can take ownership of information.